Great Soup with Chicken Sausages (serves 6) | Crappy Kitchen - Good Dinners! It is Summer time and the one meal that can be a hassle for me is Lunch. In the middle of the day I have to stop what I am doing because people start clammering for food. I am not a proponent of the cooked meats you can buy from deli and meat counters in supermarkets. They are as a rule full of things that are bad for you (nitrites for one!) and are ridiculously expensive. I also hate making sandwiches and don’t know why people think it is less trouble to make 4 or 5 sandwiches then it is to say make a quick pasta dish or a pot of soup. I think of soup just as much a summer dish as it is something people huddle around during the winter. In fact, it is easier to find ingredients that are fresh and quick-cooking when there is an abundance of produce everywhere. I’m also lucky in that I have a little backyard where I can grow herbs and have friends who have even bigger backyards who grow vegetables. When their gardens are in full swing the only way to use up the bounty is by giving it away to their friends! 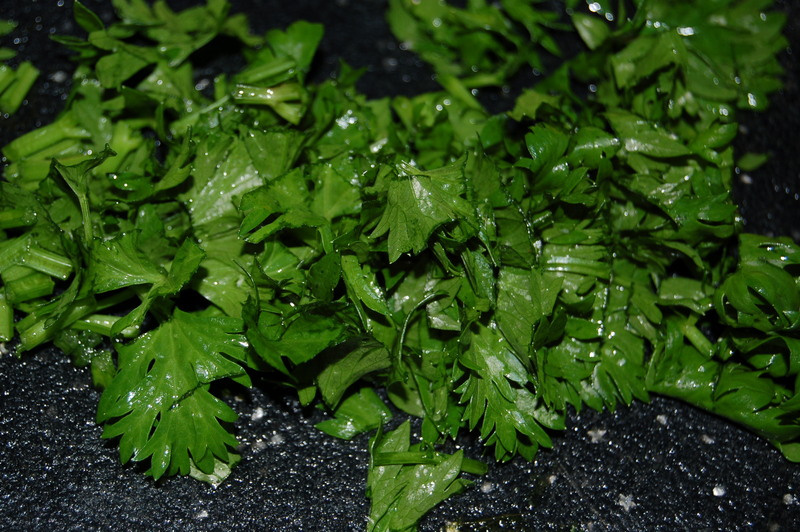 Apium leaves from my garden: apium is a cross between celery leaves and Italian parsley. It can be thrown into almost anything and has a great mild celery flavor. This soup is typical of something that I like to make for lunch. It is a great nutritious meal and can be made from whatever you can scrounge from your fridge, pantry, garden or generous friends. I made this because I had a head of escarole and 4 chicken sausages in the fridge. The rest of the ingredients were used to tie it all together. I grabbed herbs from my garden and my life-saving bouillon cube and this amazingly fresh and delicious soup was invented. In the ingredient list I gave lots of alternative suggestions to let you know that anything will work, so don’t feel you have to run off to the shop to buy a thing! 1 – Put large pot on medium heat and add the oil. Saute the onions for 5 minutes, then add the sausage by breaking it into bits with your hands as you go, or using scissors to snip it into the pot. Turn the heat up slightly and cook until the sausage takes on little brown bits from the pan (about 7 or so minutes). Stir frequently, breaking the meat a little smaller with you wooden spoon as you stir. Add the herbs. 2 – Add the seasoning (pepper flakes, salt and curry powder) and stir into the sausage. Cook for 1 minute. 3 – Add the apium (or parsley) and stir. 4 – Add the water and bouillon or stock and turn heat up to high. Add the chopped escarole (or spinach) and give everything a quick stir. When it comes to a boil, turn the heat down, cover with lid and cook at a low simmer for 10 minutes, giving it a stir a couple of times while it cooks. If the consistency feels too thick to you, add a little more water. 5 – Add the rice and stir into the soup. Turn off heat and taste for addition of more salt and pepper. Let the soup sit covered for 10 minutes before serving. Ladle into bowls and serve as is. You can pass more pepper flakes and offer salt and pepper to anyone who wants it. This entry was posted in "Blood Type A " Recipes, dinners and tagged apium, blood type A recipe, blood type A soup, celery leaves, economic meals, escarole, escarole soup, lunch, rice soup, soup, soup for lunch. Bookmark the permalink.